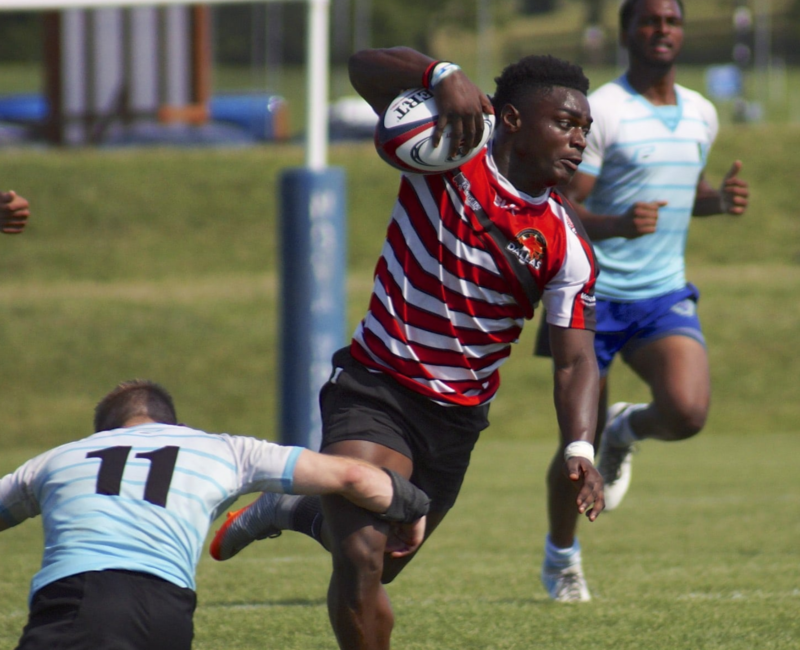 After a three hour flight to the east coast, the Dallas Reds ran all over the competition to win the 2018 Club 7s Eastern Open for an automatic berth to Nationals. After winning the first Red River qualifier last weekend, Dallas ventured to Virginia and beat the surprise of the tournament, Rocky Gorge, in the final, 26-5. Eight teams from four geographic unions gathered in Leesburg, Va. for the open event. The Chicago Lions, Optimus Rugby, Schuylkill River, and the Pittsburgh Penndemonium Pandas comprised Pool A and the Beltway Elite, Rocky Gorge, NOVA, and Dallas were in Pool B.
Schuylkill River won Pool A with a 2-0-1 record and its 12-12 draw against Optimus gave it the first seed over 2-1 Chicago. Dallas won Pool B going undefeated despite a close call versus NOVA. After dropping its first game against the Reds, Rocky Gorge rallied to beat Beltway and NOVA to close out pool play. The cup semifinals began with Dallas cracking Chicago, 26-10, and ended as Rocky Gorge beat Schuylkill River, 26-14. The Gorge-Schuylkill semifinal was not without controversy as Gorge was challenged for using too many substitutions after the match. Tournament officials determined that the result would stand as called. The championship was a rematch from pool play and Rocky Gorge made the first move scoring via a Sean Hartig try. The Reds responded with a mad dash around the corner from Kutztown speed demon Dmontae Noble and he almost added another but was chased down by Devontae Williams. Dallas stayed in Gorge’s end and was awarded a penalty try to Jake Campey to end the first half at 12-5. The second half was all Dallas as the defense clamped down and the offense kept up the pressure. Campey scored on a quick tap slicing through the defense early and Chad Joseph added another for the final score of 26-5. NOTE: Dallas has auto qualified for Nationals and that opens up the Red River Rugby Conference seed to another team! Originally the RRRC was only allocated one seed but with the auto qualification we have two this year.